Hazro came onto the monitor scene pretty recently, and a fair degree of fuss was kicked up after we released a news article about their new all S-IPS based range of screens. We've already taken a look at the newest model, their 24" HZ24W, and now we have the 26" model for testing. These are the main two screens which seem to be attracting attention at the moment, with users keen to look for S-IPS technology in these sectors. Unfortunately there aren't many competing screens, and those that are available (such as the NEC LCD2690WUXi) are less affordable to the masses. This leaves Hazro with quite a niche, certainly in the UK where the range is already available, and hopefully in the USA later in the year where it has a planned release. Hazro's website says the following about the HZ26W: "Aesthetically, ergonomically and technically astounding, the Hazro HZ26W 26” monitor provides a breath-taking interpretation of engineering and design excellence. From graphics studios to press rooms to the office floor, the Hazro HZ26W redefines the workplace to bring visuals to life. With uncompromising resolution and razor-sharp display, the Hazro HZ26W remains consistent across the harshest work environments. Wherever you’re based, whatever your needs, the Hazro HZ26W sees display technology realise perfection." The HZ26W is ultimately very similar to the smaller HZ24W, but this time the screen offers a 26 inch diagonal. Hazro sent us the black aluminium version of the 24" model, but this time we have the silver coloured regular alumium variety. The screen is attractive to look at and of very sturdy construction. Materials are all of high quality and build quality is excellent. The OSD selection buttons sit just beneath the centre of the screen and are pretty unobtrusive. On this silver coloured model, the OSD buttons still have a black background colour, and it would perhaps have been nicer to see a 'body-coloured' backing here. The stand for the screen is in the same colour as the bezel, and the back of the screen has a slightly darker casing colour. Like the HZ24W, the screen is totally flat at the back, and attractively contained within an aluminium casing. There is also a carry handy at the top of the stand for transporting the screen. The screen only offers a tilt ergonomic adjustment, but this is sufficient to position the screen comfortably in any situation. The mechanism is smooth and the stand is sturdy enough to comfortably support the screens weight. A height adjustable stand would have been useful I think, but the lack of features like rotation control are at least not really an issue at this size. The back of the screen offers interface options for DVI, VGA and RGB component (Y / PB / Pr). Certainly handy for connecting multiple sources including games consoles. The power connector is not the normal kettle lead type, and so you need an external power brick (provided of course) with this screen. It might have been nice to see a cable tie on the back of the stand but it's still reasonably easy to tuck the cables out of sight. 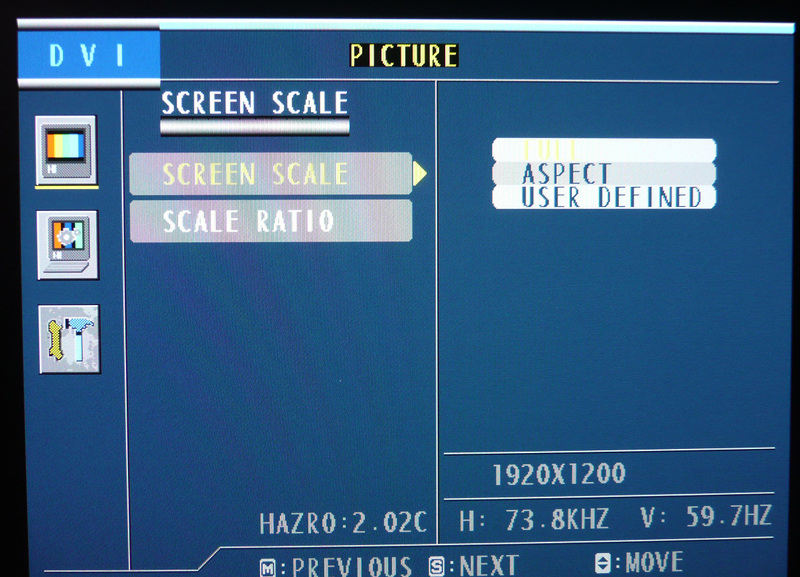 The Hazro HZ26W utilises an 8-bit S-IPS panel, capable of producing a true 16.7 million colours. 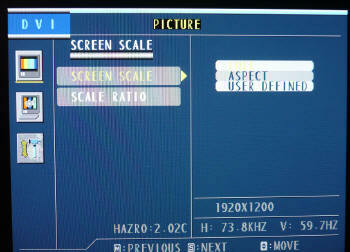 The screen uses enhanced W-CCFL backlighting and so it's colour gamut covers 92% of the NTSC colour space. An important thing to consider for most users is how a screen will perform out of the box and with some basic manual adjustments. Since most users won't have access to hardware colorimeter tools, it is important to understand how the screen is going to perform in terms of colour accuracy for the average user. I restored my graphics card to default settings and set it to its standard profile. The HZ26W was tested at default factory settings out of the box using the LaCie Blue Eye Pro and their accompanying software suite. Out of the box, the performance of the HZ26W at default settings was only average. On the left hand side of the above image you will see the familiar CIE diagram which shows that the monitors colour gamut, represented by the black triangle. This fits outside the standard sRGB colour space represented by the orange triangle. This goes to show that the screen is using wide-colour CCFL backlighting and can offer a 92% coverage of the NTSC colour space as the specification lists. To the eye, the colours do look a little deeper and more vivid, particularly in green shades. This is also evident in the CIE diagram where the monitors triangle stretches outside the sRGB space most in green shades. Below this you can see the reported measurements for gamma, colour temperature and luminance in turn. 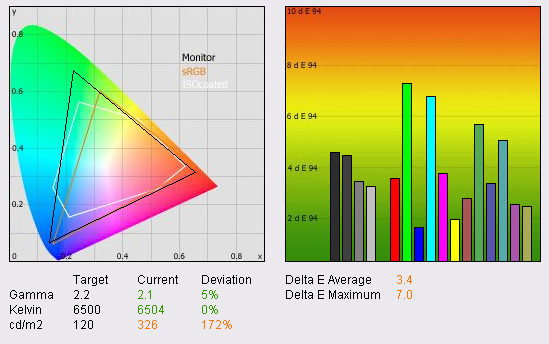 The monitors gamut at default setting is fairly accurate at 2.1, being only a little way out from the desired 2.2; this being the default for computer monitors, and the standard for the Windows operating system and the Internet-standard sRGB colour space. The screens preset colour temperature mode was left on 6500k as default, and this actually resulted in an excellent colour temperature reading of 6504k, almost spot on. Luminance on the other hand was far out from the desired 120 cd/m2, being the recommended setting for LCD screens in normal lighting conditions. This was recorded at a very high 326 cd/m2. With black depth being measured at a pretty poor 0.61 cd/m2 this gave a static contrast ratio of 534:1, a little way out from the specified 800:1. The default colour accuracy was pretty average really, and goes to show that you can't just rely on the often quoted addage, that S-IPS screens are automatically great for colour quality. DeltaE was on average only 3.4, and ranged up to 7.0 as a maximum. Clearly a degree of calibraiton would be required if you wanted to use this screen for any colour critical work, such as graphics or photography. I calibrated the screen using the LaCie Blue Eye Pro package to see what the screen was capable of with professional configuration and profiling. During this process the screens OSD settings were altered to 44% brightness and with contrast left at 68%. I used the 'user' colour preset mode which afforded me access to the individual RGB colour channel controls. These were set to 54, 41 and 50 respectively during the process. It should be noted that this adjustment only forms part of our calibration process, and the majority of the changes occur at a LUT and ICC profiling level, as an automatic process altered by our colorimeter. Gamma was now corrected to 2.2 and luminance to 121 cd/m2 as we hoped. Colour temperature remained very good at 6559k, being ever so slightly out from the desired 6500k level. With the amended luminance value we now had a slightly improved black depth of 0.56 cd/m2, still being pretty poor compared with other panel technologies and even the 24" HZ24W model (0.38 cd/m2). This gave a pretty weak contrast ratio of 218:1. I tried several different brightness settings via the OSD to see if recalibration could help improve this black depth. There was very little change and it was not possible to improve the black point beyond about 0.55 cd/m2. Colour accuracy was however corrected very nicely, and dE was on average now only 1.1. 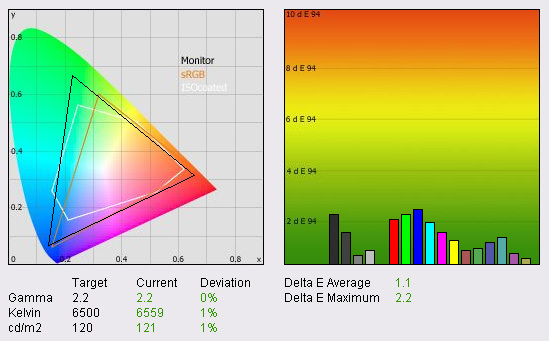 LaCie would consider colour fidelity to be pretty much excellent, on average, with the HZ26W. There was some slight discrepencies in some shades, particularly the main red, green and blue colours, but dE was only 2.2 at its maximum, leaving a barely detectable difference between requested and displayed colours in LaCie's classification. Overall the calibration proved a success, with only black depth being a little disappointing here. S-IPS panels are certainly capable of some decent colour accuracy, but calibration is often needed to get the best results. It should be noted that other panels we have tested have offered even better results in terms of dE values, but the HZ26W still performed admirably and should be suitable for colour enthusiasts and those who need reliable results in their photo and graphics work. Testing the screen with colour gradients showed no banding or obvious gradation. Viewing angles from S-IPS panel technology are widely considered to be the best in the LCD market and the HZ26W offered excellent fields of view in all directions. Vertically, the panel showed none of the very obvious contrast shift, or blackening from below, that you see from TN Film based models. Horizontally, the angles were wide, but you could detect a slight characteristic purple and blue tinge as you reached angles of about 45° away from the perpendicular. In pratice, the viewing angles of this screen were comfortable for a wide range of uses, and also were free from the off-centre contrast shift anomaly which you can see from VA based matrices. 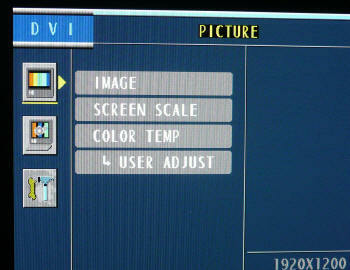 This is commonly the reason that S-IPS is selected as the LCD panel technology of choice for colour critical work, since the viewing angles are wide and free from this contrast shift you can see from VA matrices. In our usual testing process I viewed an all black screen in a darkened room, which allowed me to test the uniformity of the panel and to examine whether any backlight bleed was evident. There was very little detectable leakage from the backlighting, and the uniformity remained very consistent across the whole screen. The image shows some slight variation towards the corners, but this was far less noticeable in practice to be honest. The extra screen real estate that a 26" model offers you over a 24" model does not feel that much to me, but then day to day I tend to use 24" models anyway. If you're coming from a smaller screens, the sheer size of this screen will astound you! The screen does only offer a 1920 x 1200 resolution which is only equal to that of 23 and 24" models. This results in a slightly larger pixel pitch of 0.2865mm, meaning text appears a little larger than on a 24" model with 0.270mm pixel pitch. However, this feels a nice comfortable size for prolonged office work, and many people may find it a little easier on the eyes than the 'tighter' pixel pitch of the smaller screens. The pixel pitch is quite comparable to 19" and 22" models in the market as well. For office use, the large screen size and resolution make side by side working a treat, and you can easily split the screen down the middle for two word documents to be visible at the same time. I think you need a resolution horizontally of this size to really make the most of this feature, and the HZ26W is very good to work with here. The screen offers both VGA and DVI interfaces, with the latter offering a slightly sharper image quality. Use the pure end-to-end digital interface if you can. 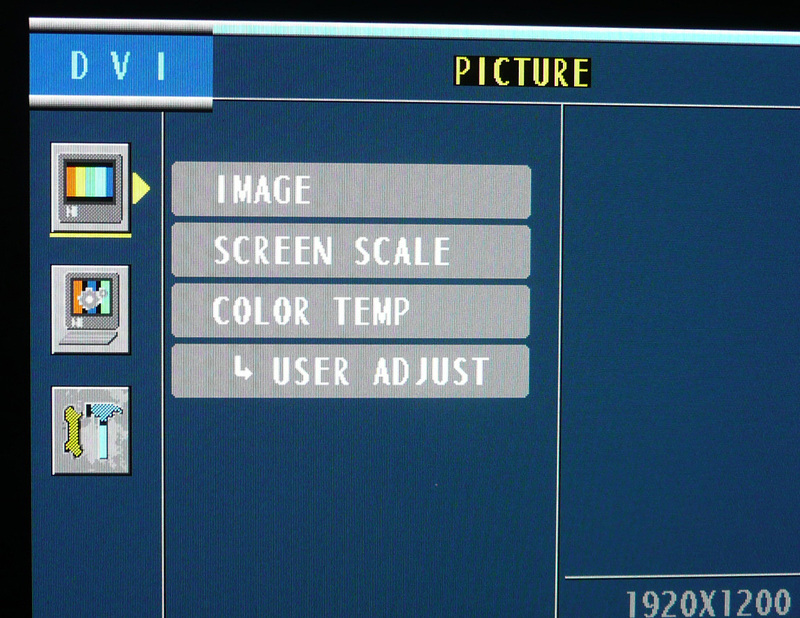 There are no preset profile modes offered from the screen such as "text" or "internet" which you commonly see on other models, but once calibrated to a comfortable luminance, the screen was perfectly fine for prolonged use anyway, even in low light conditions. You will need to adjust the luminance of the screen considerably from the default value since it is a long way off at factory settings. If nothing else, drop the brightness OSD setting down from 68 to 25. If you have a colorimeter, further, more accurate calibration is desireable. The Hazro HZ26W was tested using the chase test in PixPerAn, a good bit of software for trying to quantify differences in real terms responsiveness between monitors. As a reminder, a series of pictures are taken on the highest shutter speed and compared. The images below show the best case example on the left hand side, and the worst case example on the right hand side. This should only be used as a rough guide to comparative responsiveness but is handy as a way of keeping a constant test of each screen. As you can see from the above images, the HZ26W offered quite similar performance to its 24" counterpart, the HZ24W. There was a slight ghosting detectable in the 'best case' image, and a more obvious second ghost identifiable in the 'worst case'. In practice, the performance was actually very good, and certainly a step up from non-overdriven panels in the market. The naked eye could barely detect any ghost images, just a blurring of the moving car. 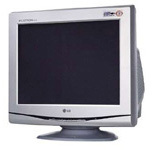 The HZ26W offers a 5ms G2G rated response time from it's S-IPS panel, manufacturered by LG.Philips. This indicates that Response Time Compensation (RTC) technology is being used here (or an ODC - Over Driving Circuit as LG.Philips refer to it) , and this is evident from our tests. For an S-IPS panel, which are historically quite unresponsive, the HZ26W performs well. Pitting the screen against our reference monitor, the NEC 20WGX2 (also S-IPS based), we can see the performance is slightly behind. The difference is not massive, but the NEC is widely regarded as one of the fastest LCD screens in the market today, and the HZ26W can't quite keep up. The HZ26W was pretty comparable to the overdriven 24" models we have tested in the past as well, including the Dell 2407WFP-HC (6ms G2G S-PVA) and Viewsonic VX2435WM (8ms G2G S-MVA) for instance. In games you can expect to see some motion blur if you know what to look for, but all in all the response time is more than adequate for some pretty decent gaming. If you want to invest in a big screen, and don't want to make the sacrifices of TN Film, the HZ26W can still offer you good performance in terms of responsiveness. 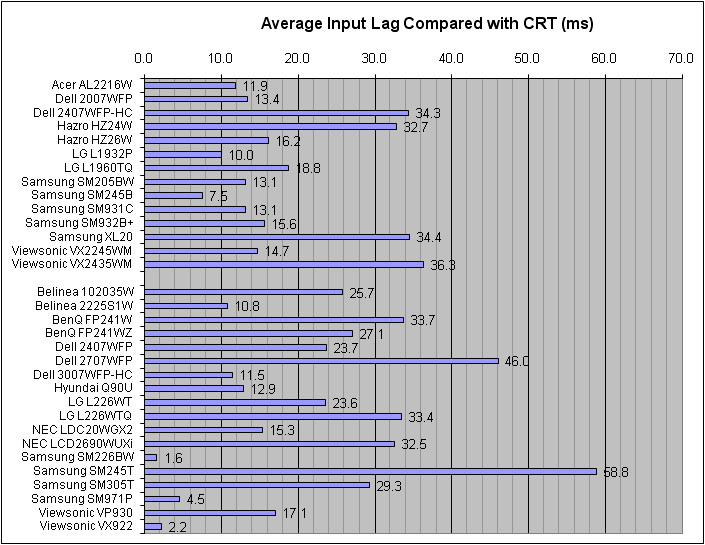 The above graph shows that average input lag was 16.2ms on the HZ26W. Commonly the lag was 10 - 20ms, but there was the odd image which showed a lag of 100ms. This was infrequent however and didn't impact on the average lag much. In practice I doubt many users would see any adverse affect of the input lag here. Screen real estate is becoming increasingly important in todays market, with LCD TV's becoming widespread and desktop monitor size on the up. The HZ26W is obviously a 26" screen diagonal and so well suited to viewing video and movie content. The size makes it a nice screen for combined desktop and multimedia use. The 1920 x 1200 resolution offered here means that a true 1080 HD resolution can be displayed, without the need for the screen to downscale at all. A 20 - 22" model can't quite offer the resolution (you need at least 1920 x 1080 for 1080 HD), but the HZ26W can. If you intend to view HD material, the resolution here is fine. HDCP support over a digital interface is vital for viewing HDCP encrypted content. Unfortunately the DVI interface does not offer this. This could prove a potential problem if you ever intend to watch Blu-ray or HD-DVD (or other encrypted content) on the screen. Interface options are important if you plan to use the screen with external devices. 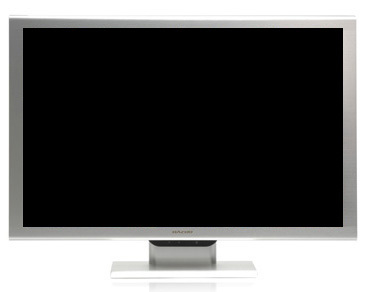 The HZ26W offers DVI, D-sub and component. The latter of which could well be handy for connecting DVD players or games consoles. It might have been nice to see an additional HDMI port included as well, something which is becoming more common on larger screens nowadays. Viewing angles should be wide, and thanks to the use of S-IPS panel technology, they are. Black depth should be good. Sadly the black depth on the HZ26W is pretty poor, with a calibrated black point of 0.56 cd/m2 being a little disappointing. In darker scenes this can mean detail is hard to pick out, and it can be difficult to seperate between dark grey tones. Uniformity should be good, since uneveness becomes very apparent in dark movie scenes and in low light conditions. Thankfully uniformity was good here, and the screen was free from any annoying leakage along the top and bottom of the screen, something which can be particularly frustrating in DVD's with black borders. Movie noise must be kept to a minimum, otherwise artefacts and twinkling in large colour masses can be noticeable. The high resolution of the HZ26W means that any compressed or low res / SD content looks a little blocky, and any compression artefacts are accentuated. Noise is noticeable as well, something which is common on S-IPS panels. However, if you sit a couple of metres away, which you'll want to with a screen this size, there is no real issue in practice. Overall the HZ26W was pretty much just a larger version of the 24" model, with performance being pretty comparable between the two. Thankfully I enjoyed the HZ24W and so using the larger HZ26W was also a pleasant experience. The design of the screen is very sleak and attractive but ergonomically it could be improved with a height adjustment. The build quality is very good and connectivity options were pleasing. The extended colour gamut that the 26" model offers is a nice addition and does help improve the colours on the screen. Sadly black depth let the screen down and is pretty poor, even for an S-IPS panel. Apart from this, there were no real issues with the screen, and it offered decent colour accuracy once calibrated, wide viewing angles and good responsiveness. The screen currently retails for around £556 in the UK, making it a reasonably affordable option compared with some of the competing 26" non-TN Film models.